Those who regularly check in to At the Scene of the Crime probably know by now of the fondness I’ve developed for Paul Halter. His book Le Roi du désordre (The Lord of Misrule) was a very flawed book, but one I loved reading, which reminded me just why I love mysteries. The freshness of Halter’s impossible crimes is invigorating— not since John Dickson Carr have we been graced with an author who makes impossible crimes so central to his work. I eagerly devoured La Tête du tigre (The Tiger’s Head) and Le Tigre borgne (The One-Eyed Tiger): while I found Tête flawed, I found Le Tigre borgne a masterpiece, which left me eagerly hungering after more by Halter. I decided to satisfy this craving with Halter’s 1994 novel À 139 pas de la mort (139 Steps from Death), the second of five books found in my Paul Halter omnibus (Volume 3). This novel, like La Tête du tigre, stars the detective duo of Dr. Alan Twist and Inspector Archibald Hurst. Again, although they are rather colourless, I find this refreshing— Halter doesn’t waste time giving us Hurst’s marital problems or Twist’s struggles against agoraphobia. They are just the detective duo, with Twist taking on the role of the Great Detective, and Hurst being his Watson figure. Roland Lacourbe, who introduces the volumes in my omnibus, seems to consider À 139 pas de la mort a minor work of Halter’s. Though I wouldn’t put this in the same league as Le Tigre borgne, it is better than Le Roi du désordre or La Tête du tigre. Its plot moves breathlessly, and Halter’s imagination, as always is fascinating. The characters are rather weak, but interesting enough to hold the plot together. Halter, like Carr, has a weakness with characterization— but with plots so dazzling, I’m more than willing to forget all about it! There is a strong atmosphere in À 139 pas de la mort, but not one of supernatural terror: rather, the entire novel is a surrealistic phantasmagoria. The proceedings begin with the adventures of Nevile Richardson, a young lawyer going through an identity crisis. As it turns out, he doesn’t really want to be a lawyer, and he wishes for a little bit of excitement. Fate hears his plea and grants him his wish, thrusting him smack into the middle of a sensational case that will become known as “L’Affaire des chaussures” (The Shoe Mystery). It all begins when he notices a damsel in distress and decides to go after her and offer to help. He witnesses her discussion with a sinister man with a hoarse voice, but when he goes to sit beside her, she mistakes him for someone else, and begins to talk of an appointment on the 16th, something to do with a bird and her thumb. She soon realizes her mistake, stops talking, and begs Nevile to forget all about her. Which of course he doesn’t, and in the meantime, Dr. Twist and Inspector Hurst get a visit from a man named John Paxton, who has a most bizarre tale taken straight from the Sir Arthur Conan Doyle playbook. He talks about how he answered an advertisement in a newspaper for a job and was offered the position: it required him putting on specific clothing, provided for him, and delivering a letter to a certain place, taking a most unusual, indirect route. He leaves the letter he brought and takes back the one that was waiting. But here’s where things get really strange— Paxton, curious, decided to steam open the letters, and discovered that he was delivering nothing but blank sheets! This situation reminded me enormously of Doyle’s The Red Headed League. The 16th comes, and Dr. Twist (whom Nevile has consulted in the meantime) deduces just what the damsel in distress meant to say. Off goes Nevile to the correct place, only to find that there is a corpse in the designated location, surrounded (for apparently no reason) by shoes… The corpse belongs to John Paxton! The police are baffled, but things spiral out of control when they receive a phone call from a man with a hoarse voice, telling them that they should go to the late Louis Fiddymont’s house in the village of Pitchford if they want to know more about The Shoe Mystery. Off go Hurst and Twist, discovering all the entryways into the house securely locked (or completely cut off by ivy). They force open the front door and walk into the house, covered with five years’ worth of dust. In one of the rooms, they make a shocking discovery: there, in a chair in the middle of the room, is a decayed corpse which (as the medical examiner tells them) hasn’t been there very long… with no footprints anywhere in the dust! In fact, there are no footprints anywhere in the house! But possibly the strangest thing of all is this: the house is simply full of old, dusty, used shoes… 139 pairs, to be exact. 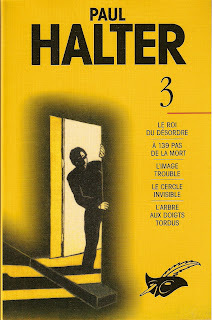 Halter, not content with simply delivering a locked room, gives you a double impossibility that keeps you guessing. The solutions behind both are clever and quite satisfying. Although the clueing is somewhat weak this time around, Halter persuades you of the inevitability that only X could have done such-and-such. The explanation behind Fiddymont’s obsession for used shoes is absolutely brilliant, and the revelation of whodunit and how surprised me greatly, though maybe it shouldn’t have. Overall, this is a good, solid effort from Halter, who delivers just what he promises: a good yarn with a clever impossible scenario that keeps you compulsively turning the pages. It's impossible to deny that Paul Halter shows more imagination in one books than most modern crime writers do in their entire careers, but I become wary when I read that the clueing is weak, which is a complaint that's often chucked at his head – and you have to ask yourself how good a detective story really is when there are barely any clues to study. A complex, but solvable!, problem is the most important ingredient for a good and satisfying mystery! The part of the clueing that is weak is settling on X as the culprit. The locked room is brilliantly clued, as is the reason for the late man's shoe obsession. And overall, it was satisfying. Interesting review. Since I have read this title fifteen years ago, I couldn't remember the details of the plot, but you reminded me most of them.It was a fun mystery, and I liked its quirkiness and eccentricity. The lack of clueing didn't bother me much. About the past cases named in the book (Juggler Palmer or the stolens cans) I can say that they don't appear in any other novel by Halter (to this date). Thanks for commenting, Gregory! Just like you, I enjoyed the fun of the mystery, the surrealistic, almost dream-like way events keep piling on each other. The clueing is only an issue, really, for settling on X as the culprit - the resolution for the footprints-in-the-dust was brilliantly handled, I thought, with the main clue parading all over the place and yet managing to slip by unnoticed. It's unfortunate that Halter hasn't transcribed those cases yet, but I'm certain they would make for wonderful reads!